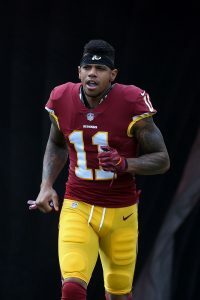 The Jets are close to a deal with free agent wide receiver Terrelle Pryor, tweets Ian Rapoport of NFL.com. Mary Kay Cabot of Cleveland.com reported Wednesday that Pryor was choosing between New York and Seattle. Despite his disaster of a 2017 campaign, Pryor could be in line for a starting role with Gang Green. Jermaine Kearse is locked in as one of the Jets’ top-two wideouts, but Robby Anderson has been arrested twice in the past calendar year and could theoretically be facing a league-imposed suspension. New York used three wideouts on 63% of its offensive plays a season ago, so Pryor will likely see a good deal of action as part of a depth chart that also includes Chad Hansen, ArDarius Stewart, and a rehabbing Quincy Enunwa, among others. Pryor, of course, was anything but successful in 2017 after inking a one-year deal with the Redskins. Before landing on injured reserve in November, Pryor managed only 20 receptions, 240 yards, and one reception in nine games (two starts). Expected to serve as something close to Washington’s No. 1 receiver, Pryor was instead outplayed by Jamison Crowder, Ryan Grant, and Josh Doctson, and the Redskins didn’t seem to have any interest in retaining him. Cleveland saw the best of Pryor in 2016, as put up an astounding 77/1,007/4 line during his first full season as a wideout. The Browns, who reportedly attempted to trade for Pryor during the 2017 season., were also in Pryor, while the Rams also expressed some level of interest, but — like Cleveland — never set up a visit. I like it…He is the best receiver still available and those young kids at Washington, that saw more action, are all very talented. I’m glad he isn’t signing with Seattle. Pryor has one of the worst catch % in the NFL. IMO Hurns is the best WR on the market. Is he really ‘worth it’ ? Guessing no one else actually available …. I guess being 6’6″ is a positive.